Ministry of Interior of Kuwait informed about the biggest-ever human trafficking case in the country’s history. They claimed about an order to arrest nearly 3,000 foreigners of various nationalities. According to officials, around 90 people were taken into custody for the last several days. Arrested people are suspected of entering Kuwait using fake work documents. Kuwait News Agency (KUNA) informed that in the course of investigations, it was found out that those suspects had paid amounts of money to imaginary companies that signed contracts with various government agencies, so they can carry on working in Kuwait illegally. 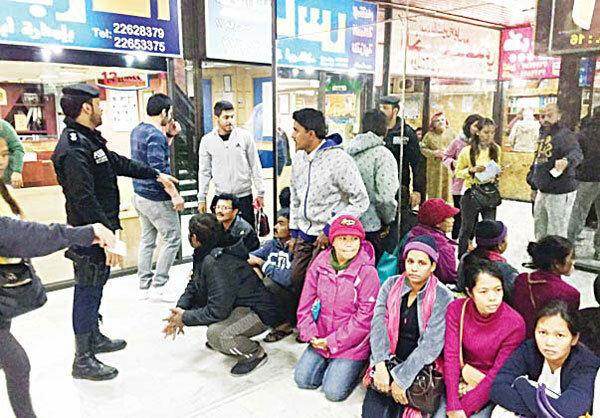 The detainees admitted that they had come to Kuwait using free visas after paying an amount of money in exchange for entering Kuwait and being allowed to work wherever they wanted. According to media, suspects are mainly Pakistanis followed by Bengalis and then Egyptians. Pakistani expatriates paid about 3,000 Kuwaiti dinars ($ 9,870) each. Among 3,000 immigrants there were several people who are suspected to be part of a ring of an organized crime operation. For example, one Syrian citizen was kept under arrest as he turned out to be the mastermind and the one who attempted to complete the necessary paperwork with government agencies, enabling the three imaginary companies to bring this huge number of employees to work illegally in the country. The Government of Kuwait is making significant efforts to tackle the problem with trafficking in the country for last few years. According to the official statistic, in 2017 the government investigated 60 potential trafficking cases, that is for six investigation more than in 2016. For example, the government charged all 22 defendants, including four Kuwaiti nationals, with trafficking under the 2013 anti-trafficking law. But the latest trafficking case is the biggest-ever human trafficking case in the history of Kuwait. Nearly 3, 000 foreigners were captured as it turned out that they were granted fake residencies through imaginary companies holding government contracts. And this case has become a real challenge for the parliament that put so many efforts in this war against trafficking for the last few years. Upgrading current methods and tools is a necessary step for controlling and eradicating the situation in the country and to do so is only possible with the use of modern technologies. The Government of Kuwait demonstrated significant efforts by initiating more investigations and prosecutions; referring significantly more cases of illegal recruitment for criminal investigation; amending the domestic worker law to disincentivize unscrupulous recruiting practices, and operationalizing a government-run central recruitment company intended to reduce recruitment costs and combat illegal recruiting fees. Still trafficking has become a challenge for the country. Criminals find new ways and methods to carry out illegal actions all the time evading identification and escaping persecution. This is about to change because iCognative by Brainwave Science is that technology that cannot be cheated even by the cleverest criminals. iCognative is a special technology that can determine if a person knows specific information. The technology can be used on every suspect in every particular crime and identify if the crime-related information is stored in the brain of the suspect. In this way, iCognative can help investigators to find out who from suspects is a criminal and who is an innocent. For example, in the complicated situation with trafficking in Kuwait, the technology can help to identify the involvement of every arrested person in trafficking. In order to conduct the test crime-related information along with investigation related confidential information will be used. It will contain details regarding the investigation that can be known only to the criminal (dates of the illegal entry in the country; names of the fake workplace, its address, position; pictures of fake documents; photos of organizers; specific communication protocols used; monies transferred from accounts to specific individuals etc.) Within an hour of testing iCognative will determine with over 99.9% accuracy who from suspects has this concealed crime-related information in the brain. iCognative is a unique technology that has no known countermeasures because it taps into the brain- the only part of the human body that cannot lie, the technology shows revolutionary levels of accurate results. The test is extremely applicable because it is not possible to find evidence in every trafficking situation and iCognative works even in absence of any evidence. After years of research and development, iCognative launched by Brainwave Science can finally be used worldwide as the modern technological advancement because the system is user-friendly and can be customized in any language. iCognative is an avant-garde technology ready to solve the difficult situations with trafficking in Kuwait. Only with the use of this brilliant technology investigators can identify traffickers quickly and ensure national security for their citizens.